Flooring is arguably one of the most important décor components when it comes to home design. The style of floor you choose can help lay the foundation for the rest of your room. Deciding on what flooring best fits your preference and lifestyle should be the first step in any room remodel, as flooring is essentially the canvas that other parts of your room will build on. The perfect flooring should be able to withstand and fit into your lifestyle. When determining which type of flooring is right for you, it’s immensely important to consider how it will wear. If you have children or pets, choosing a durable flooring style is the best option, such as laminate flooring or even a Stainmaster® carpet. When you’ve decided on which style of flooring is best suited for your lifestyle, it’s time to decide on other components for your room’s design. Flooring has the ability to truly create or change the mood of any room. 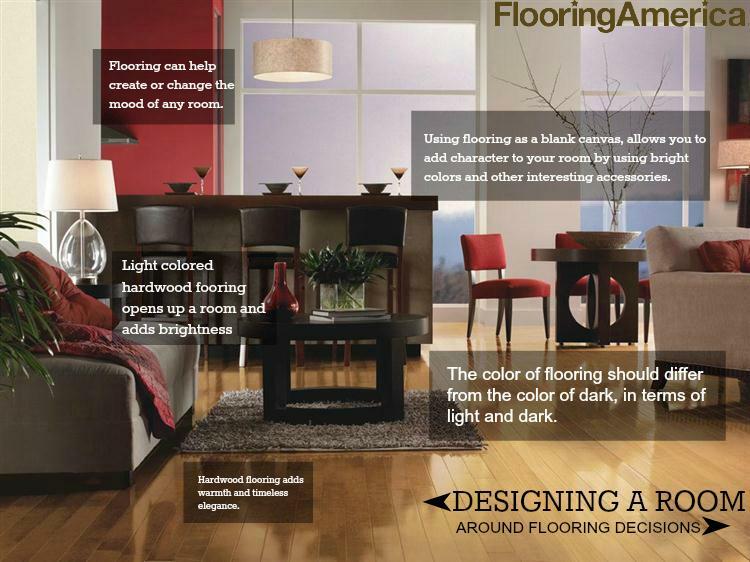 Depending on the look and mood that you want to create throughout your home, flooring is the first step. Dark hardwood flooring helps create a warm and often rustic aesthetic that is timeless and elegant. Conversely, light colored hardwood flooring helps open up a room and add brightness. The same holds true for other flooring styles when it comes to color. Rich and dark colors are perfect for larger rooms, as they add drama and create a more intimate mood. Light colors are ideal for smaller rooms, and can often even make your room appear larger. After your preferred color is decided, choosing accents, furniture and other décor elements is much simpler. Flooring can either be the star of the room, or simply a backdrop for other design elements. It’s important to decide right out of the gate if you want your flooring to be the focal element of your room’s design, or simply a neutral canvas for which furnishing and accessories will be the star. If you decide to use flooring as the main focal point of your room, consider rich hardwoods or decorate tile flooring. The beauty of these flooring styles is sure to help you achieve your goal. If you want your flooring to be a blank canvas that allows other elements to pop, consider neutral colored carpet and add bold elements throughout the room that will catch the eye.